The first image hosting application on the market with affilate module. 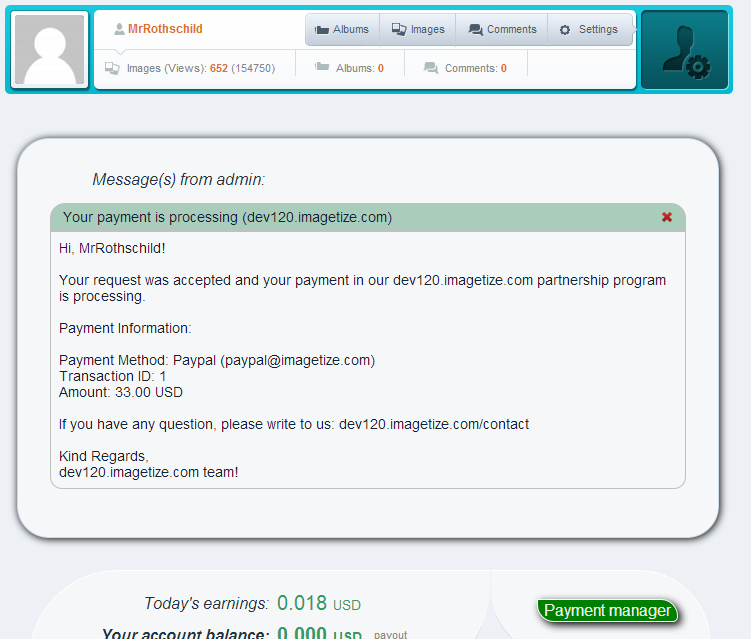 The imagetize script is the first script on the market which offers the Pay Per View module (affiliate program). It enables its users to earn on display of their images. The users upload their pictures and they gain traffic thanks to which you earn on the display of advertisements. 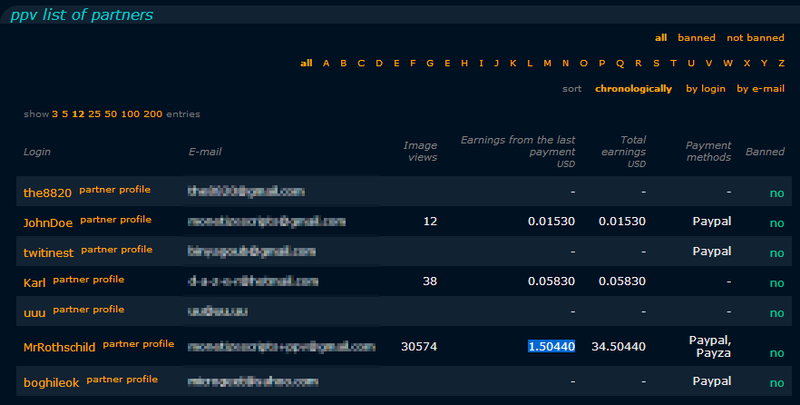 Right after logging in you know how many times the images were displayed in a given day, the amount of total earnings and which partner collected the biggest amount of money. You can create as many tiers as you want. 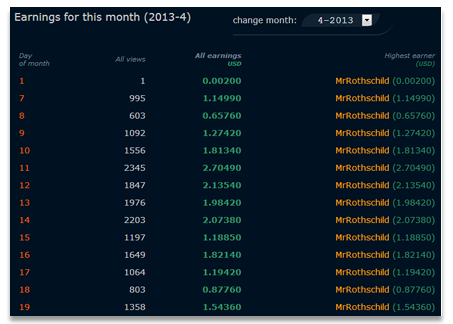 In each tier you can place the chosen amount of countries. For each tier you indicate the payment rate for 1000 unique displays. 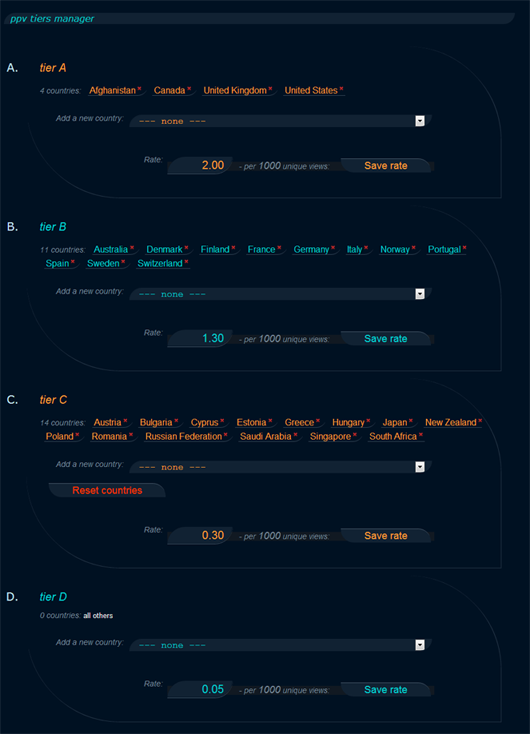 The countries that are not assigned to a given zone automatically create the "All others" group for which you also set the rate for 1000 unique displays. You are the one who decides whether or not you accept the adult images on your hosting. Depending on your settings in the administrator's panel, such information will be displayed in the upload box. 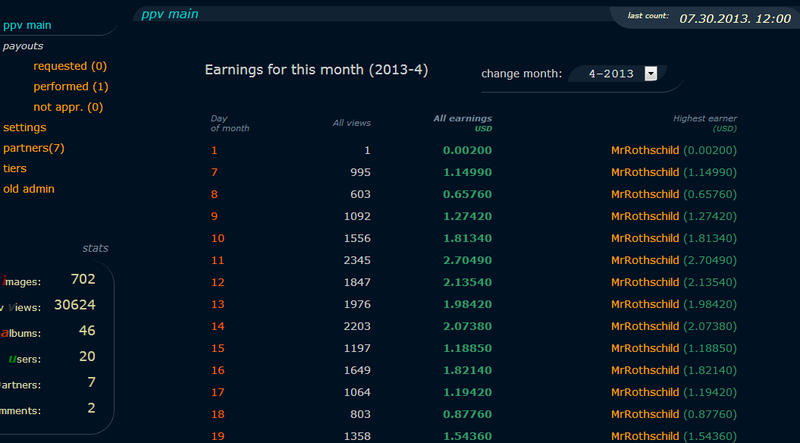 You can decide in which currency your partners will earn. 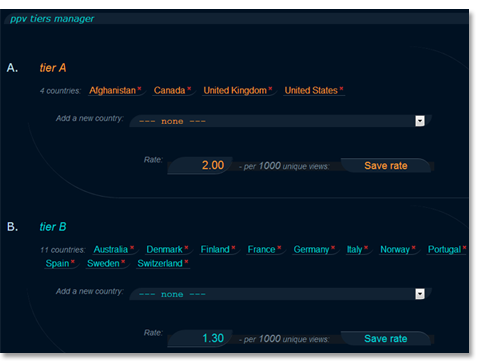 You can select it from the list of 164 currently used currencies in the world. You have the possibility to set the minimal earnings level that your partners have to achieve in order to be able to pay out their money. You can select any payment method that you wish. It is enough to enter its name in the system together with the ID which identifies the defined user in this system. 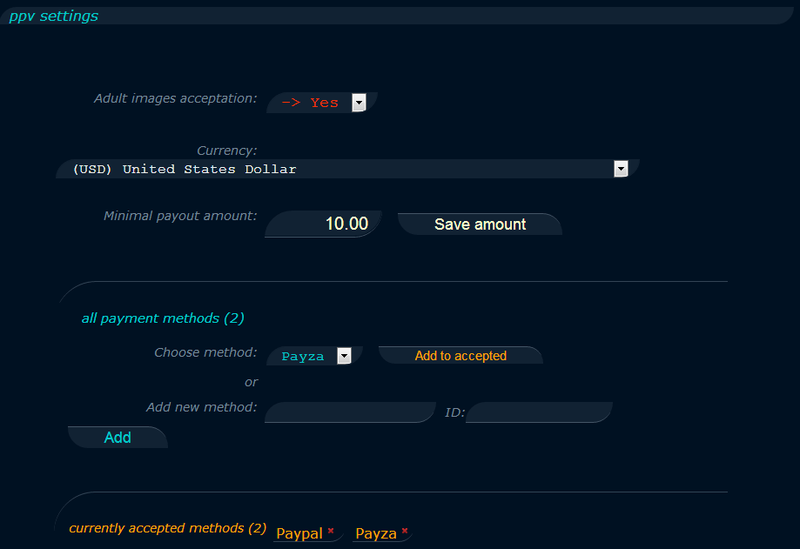 For example, if you want to add PayPal as your payment method, you have to enter "Paypal" in "Add new method:". In the "ID:" box you have to enter the "e-mail". 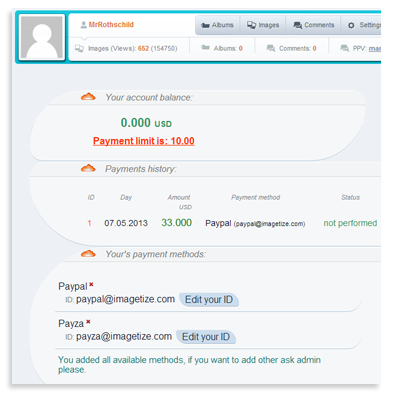 You can proceed similarly in case of adding such systems asPayza, Paxum, Webmoney etc. The user who earned the money in the amount exceeding the minimum threshold of payment can require the disbursement. However, it is not automatic and immediate. In order to protect you from cheaters and breaking the rules of your website, you receive information on the fact that a given user wants to disburse money, but you have to make the payment manually, outside of our script. Thanks to this you have the time necessary to view his/her images and to check whether he/she did notmake any fraud or break the rules of your website. 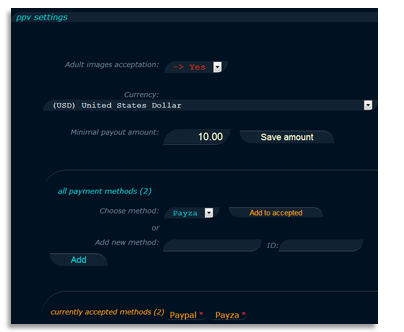 Only the entry of one unique IP to the image's subpage is converted to money (e.g. Yourwebsite.com/image/number.html) during24h. The entries of users to their images are not counted. 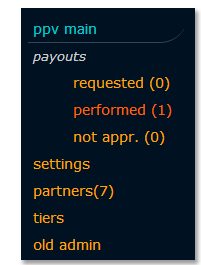 The list of payment requests from the users who collected the amount exceeding the minimal threshold. The service administrator should review the images of that partner, check whether their compliant with the rules and whether there were no violations. If everything is fine, the money is transferred through the system selected by the partner as the preferential one. Then, the administrator marks the payment as "performed" and it is placed on that list. Information about that fact together with all details is sent to the partner's e-mail address and it is displayed on his/her profile. If the administrator found out that the images are incompliant with rules and that there was a violation, he/she may not accept such payment request. The partner will also be informed about that. 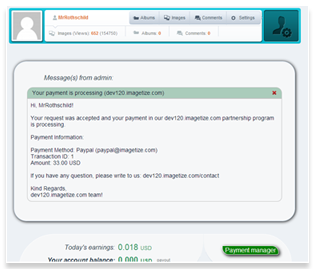 In the administrator's panel you are able to quickly review all partners which earn money on your website. The table contains all crucial information concerning the users such as: e-mail address, number of displays of his/her images, earnings after the last payment, earnings in general, preferred payment methods. 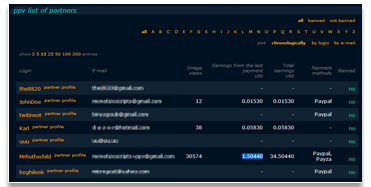 The partner has access to the information on how much he/she earned on a particular day of month (data from the past can also be reviewed)and how many paid displays of his/her images occurred. He/she knows also how much money he/she collected in total from the previous payment. Partner may check how much he/she earned and request the payment. Additionally, he/he may add/edit/delete the payment methods that he/she wants to use. Next to every image, the number of its displays and the amount it earned is displayed.